This site profiles the gardens that are part of the Urban Farm and Garden Alliance in the Rondo and Frogtown neighborhoods of Saint Paul, MN. It is a collaboration between the Urban Farm and Garden Alliance, Bethel Library, and Harley Schreck's Fall 2017 Urbanism class who researched and visited each garden and entered their results into this interactive archive. Urban Farm and Garden Alliance Day! Urban Farm and Garden Alliance was awarded the Ramsey County Farm Family of the year award! A few members of the Alliance drove down to Monroe, MN to attend Farm Fest and receive our award, in person, from Governor Mark Dayton! The award came from College of Food, Agriculture and Natural Resource Sciences (CFANS) and UMN Extension. It is an honor to be recognized for all of our hard work and the strong relationships we have built together over the last year. We truly are a family! 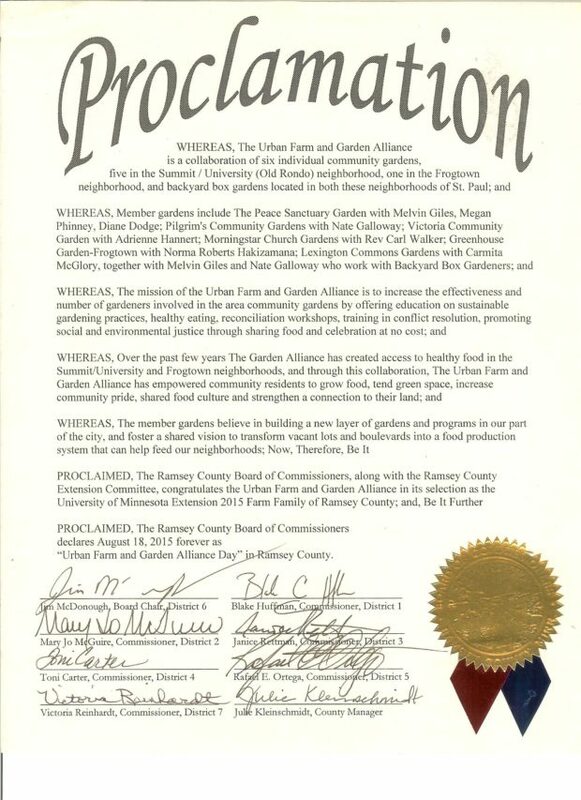 The award will rotate around to our different gardening sites in St. Paul. Thank you for all of your support in continuing with our mission and goals! It was not possible without each and everyone who has been involved with the alliance. Sincere THANKS to everyone. First meeting of the Garden Alliance—setting up plans for an amazing summer of celebrations, workshops, and growing beautiful food! Special thanks to Pilgrim Baptist Church, the oldest African American Congregation in St. Paul, for hosting the meeting.